4-H youth explore veterinary and animal science by learning to feed, train and care for dairy, meat and hair goat projects. 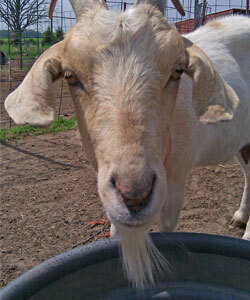 Ever wonder why a goat has a beard? Goats—dairy type, pygmy, Angora and Boer—make great 4-H projects. They are relatively easy to handle, interesting and inexpensive to keep. In addition to learning about traditional animal care in a 4-H goat project, you can explore the use of products that come from goats such as milk, meat and fiber. You also can participate in activities such as quiz bowl, skillathon and judging, that don’t require you to own a goat. Raise your hand for Michigan 4-H! Join me in voting for Michigan 4-H to support the next generation of 4-H’ers. Have you ever thought about how you can prevent a fire in your barn? Read this tips for reducing the risk and being prepared for a barn fire. Being prepared during cold, winter weather will help your livestock winter a little easier. Kathy Grau and Mary Hammer of the Washtenaw County 4-H Junior Livestock Committee were among four Michigan Farm Bureau 4-H Excellence in Agriculture Award recipients.